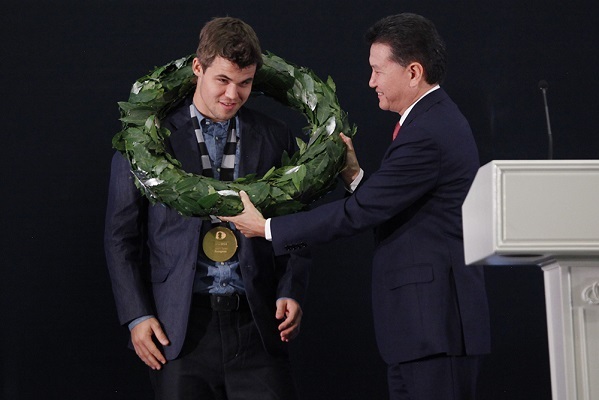 Happy birthday to the World Chess Champion MAGNUS CARLSEN! Many more successes in the future! The famous Cuban chess player became the World Chess Champion in 1921 by beating Emanuel Lasker. He kept his title until 1927 when he lost it to Alexander Alekhine. One of the greatest players of all time, he was renowned for his exceptional endgame skill and speed of play. Due to his achievements in the chess world, mastery over the board and his relatively simple style of play he was nicknamed the "Human Chess Machine". Capablanca Memorial 2014 took place between 8th and 18th May 2014 in Havana, Cuba. The winner in the Elite group is GM Wesley So with 6.5/10 points. Mikhail Tal was a Latvian (Soviet) chess Grandmaster and the eighth World Chess Champion (from 1960 to 1961). He is recognised as one of the greatest chess players of all times for his creative combinatorial style. He will be forever remembered by many people as "The Magician from Riga" and as the most exciting attacking player to ever play chess. The annual event Tal Memorial 2014 was a blitz chess event held on 13-14 November 2014 in Sochi, alongside the World Chess Championship match. The winner was Shakhriyar Mamedyarov with 16/22 points. Our aim is to provide LIVE commentary on most of the games between Anand and Carlsen in their fight for the title of World Champion. 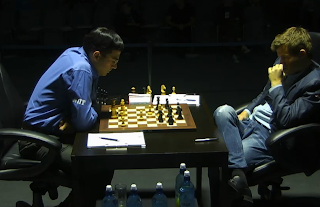 Our distinguished commentator GM Alexander Delchev provides live commentary on the game in round 7. Our aim is to provide LIVE commentary on most of the games between Anand and Carlsen in their fight for the title of World Champion. Our distinguished commentator GM Alexander Delchev provided live commentary on the game in round 4. SAINT LOUIS (November 4, 2014) From the same venue that hosts such high-quality events as the U.S. Championships and the global super-tournament Sinquefield Cup, the Chess Club and Scholastic Center of Saint Louis now presents a high-stakes slugfest between two of the world’s heavyweights. The United States’ super Grandmaster Hikaru Nakamura will square off with GM Levon Aronian, the pride of Armenia, in the Showdown in Saint Louis from Nov. 21-25. The special head-to-head exhibition will go five rounds, including four classical games of chess and a final round featuring 16 games of Blitz. The two kings will fight for the lion’s share of a $100,000 purse. Nakamura, the top American player ranked No. 9 in the world, is in the hunt for his first Candidates Tournament appearance and currently sits in second place halfway through the 2014-2015 FIDE Grand Prix cycle. Aronian, a veteran to the world ranks currently at No. 4, has long-been regarded as the main rival to World Champion Magnus Carlsen and reached his career-peak rating of 2830 earlier this year. The Showdown in Saint Louis will settle the score from the players’ last meeting, drawing twice at the 2014 Sinquefield Cup in the U.S. Capital of Chess last September. As a special feature to the Showdown in Saint Louis, 20 high-tiered chess players will look to prove – and earn – their stripes at the CCSCSL. Surrounding the heavyweight fight will be two 10-player, round robin tournaments designed for players to earn International Master and Grandmaster title norms. The GM norm event features Grandmasters Ben Finegold, Denes Boros and Samy Shoker setting the standard against such players as IM Sam Sevian and IM Priyadharshan Kannappan, both dangerously close to earning their new titles. The Showdown in Saint Louis and surrounding GM/IM norm tournaments will be streamed live on www.uschesschamps.com and once again feature live play-by-play and analysis from the renowned commentary team of GM Yasser Seirawan, GM Maurice Ashley and WGM Jennifer Shahade. Live spectators may take in all the action as it unfolds in the upstairs tournament hall of the Chess Club and Scholastic Center of Saint Louis, with admission free-of-charge for annual, monthly and day members. For more information as it unfolds, visit www.uschesschamps.com. THANK YOU EVERYONE FOR TAKING PART IN OUR WORLD CHAMPIONSHIP QUIZ! The longest World Championship game comprised 124 moves and finished in a stalemate. Who were the players and at which World Championship? Answer: Viktor Korchnoi vs Anatoly Karpov, World Chess Championship 1978. 3. All answers should be sent to ChessBomb together with your ChessBomb username as a message on Facebook or Twitter. The International TASHIR Chess Tournament in memory of Tigran Petrosian took place between November 3 and 11 at Novotel Moscow City. The tournament is dedicated the 9th World Chess Champion, who would have celebrated his 85 birthday this year. Brilliant performance by Alexander Grischuk who went undefeated and won with 5.5/7! Who are the players in the picture and at which World Chess Championship? 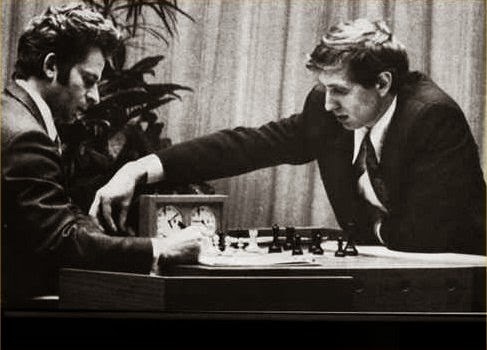 Answer: Spassky vs Fischer at the World Chess Championship 1972. Wait for the FINAL question on Wednesday, 12th November, before the start of ROUND 4 of the World Chess Championship! The BiG prize draw for an annual ChessBomb premium account is also on Wednesday! Both the players were under tremendous pressure coming into this game. The championship was precariously balanced with only a point's difference between Anand and Carlsen. A small error on the part of either of them had the power to change the course of the championship dramatically. Before the match, chess Grandmaster and commentator Susan Polgar tweeted "99.99% of the fans at home can't understand the amount of pressure Carlsen and Anand are going through right now. Very intense! I can tell you from experience playing in WC match. So much pressure at this stage, no matter if you're leading/trailing by 1." Berlin defence was played in game 11. Learn about Ruy Lopez-Berlin defence here. As usual Carlsen forced a queen trade-off as early as move 8 in the game. This is the sixth time in this championship that Carlsen has pulled off this manouvre, and he did it in style. As he only needed a draw he was intent on taking the queen off the board to minimise danger. In move 15, Carlsen placed his Knight in 'D5' which was a powerful move as he gained control at the center. But even uptil this point, the game was open. From move 18 to 23, Anand managed to place his bishops in better squares and for some time the chess engines showed a slight advantage for Anand. It looked like he had created a comfortable position for black and was all set for a long fight. Carlsen recounted this in the post-match press conference, "Perhaps I didn't move accurately from 18 to 23 moves. It was tight." .... all the chess experts gave Anand a clear advantage. 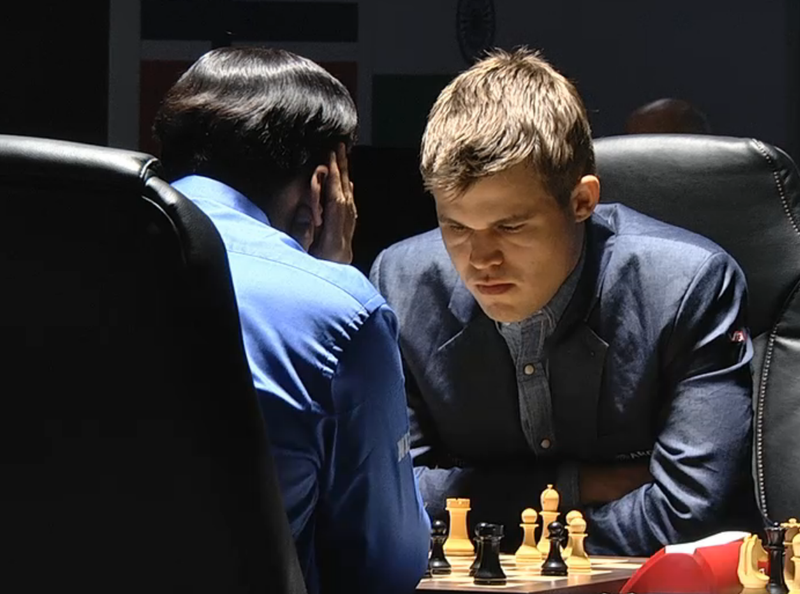 Many chess observers felt that if Anand moves 'Be7' then it would be very difficult for Carlsen to take advantage. At this point, Indian Chess Grand Master Ramesh tweeted, "Anand in driver seat!" Polgar tweeted, "3 reasonable choices: Be7, Bg7 or Rab8. Strongest is Be7." Anand went with 'Rab8'. What came next surprised everyone. Mikhail Tal (9 November 1936 - 28 June 1992) was a Latvian (Soviet) chess Grandmaster and the eighth World Chess Champion (from 1960 to 1961). He is recognised as one of the greatest chess players of all times for his creative combinatorial style. He will be forever remembered by many people as the most exciting attacking player to ever play chess. Tal had a completely different approach. He continually sought to confuse the issue. He had an incredible ability to judge a complicated tactical thrust without necessarily working out the precise variation in advance. He trusted his instincts on the outworking of a sacrifice. If he liked his chances or if the possibility held intrigue, he invariably went for it. Tal was also a highly regarded chess writer. He also holds the records for both the first and second longest unbeaten streaks in competitive chess history. We calculate: he does this then I do that. And Tal, through all the thick layers of variants, saw that around the 8th move, it will be so and so. Some people can see the mathematical formulae, they can imagine the whole picture instantly. An ordinary man has to calculate, to think this through, but they just see it all. It occurs in great musicians, great scientists. Tal was absolutely unique. His playing style was of course unrepeatable. I calculated the variants quickly enough, but these Tal insights were unique. He was a man in whose presence others sensed their mediocrity. He led a very unusual life. He didn't think of anything. He lived here and now, and this enormous energy was always around him. The positive energy. Tal was one of the few completely positive people I knew, he wasn't contentious. Chess is very contentious game by its nature, and he wasn't. Tal: Chess, first of all, is Art. Known as "The Magician from Riga", Tal was the archetype of the attacking player, developing an extremely powerful and imaginative style of play. His approach over the board was very pragmatic. He often sacrificed material in search of the initiative, which is defined by the ability to make threats to which the opponent must respond. With such intuitive sacrifices, he created vast complications, and many masters found it impossible to solve all the problems he created over the board. Although his playing style at first was scorned by ex-World Champion Vasily Smyslov as nothing more than "tricks", Tal convincingly beat virtually every notable grandmaster with his trademark aggression. Viktor Korchnoi and Paul Keres are two of the very few with a significant plus record against him. Tal contributed little to opening theory, despite a deep knowledge of most systems, the Sicilian and the Ruy Lopez in particular. But his aggressive use of the Modern Benoni, particularly in his early years, led to a complete re-evaluation of this variation. A variation of the Nimzo-Indian Defence bears his name. Tal was a prolific and highly respected chess writer. He wrote four books: one on his 1960 World Championship with Botvinnik, his autobiography The Life and Games of Mikhail Tal, Attack with Mikhail Tal co-authored by Iakov Damsky, and Tal's Winning Chess Combinations co-authored by Viktor Khenkin. His books are renowned for the detailed narrative of his thinking during the games. The Mikhail Tal Memorial has been held in Moscow annually since 2006 to honour Tal's memory, and many distinguished chess players has honour his memory by taking part. Who are the two players with most wins against undisputed world champions who have never become world champions themselves? Answer: Paul Keres and Viktor Korchnoi are the only chess players to have defeated nine undisputed world champions each. Neither has been a World Champion himself. Wait for the THIRD question on Tuesday, 11th November, before the start of ROUND 3 of the World Chess Championship! Our commentator today is the young IM Tihomir Yanev sharing his thoughts about the round 2 game. Our aim will be to provide LIVE commentary on most of the games between Anand and Carlsen in their fight for the title of World Champion. Starting now, with a live commentary provided by our distinguished commentator GM Alexander Delchev. The official opening ceremony of the World Chess Championship match between the reigning champion Magnus Calsen (Norway) and the challenger and former World Champion Vishwanathan Anand (India) took place at the Congress Hall of the Radisson Blu hotel in Sochi on November 7th, 2014. After the ceremony, the Chief Arbiter of the match Andrzej Filipowicz (Poland) called for the drawing of lots. In the first game Vishwanathan Anand will play with white. The first game of the World Chess Championship match takes place November 8th, at 3 pm local Moscow time. A total of 12 games will be played with classical time control: 120 minutes for 40 moves, then 60 minutes for 20 moves, and then 15 minutes plus 30 seconds per move for the rest of the game. If the match is tied, the tie-break with quick time controls will take place on November 27th. The Opening Press Conference followed the Ceremony on 7th November 2014. Among the officials were FIDE President Kirsan Ilyumzhinov and Russian Chess Federation President Andrei Filatov, but there were also numerous World Champions, including Boris Spassky, Alexandra Kosteniuk and Anatoly Karpov. Carlsen: Thanks for having me here in Russia. I’m looking forward to start the match and thanks to all the people who are here for being here. 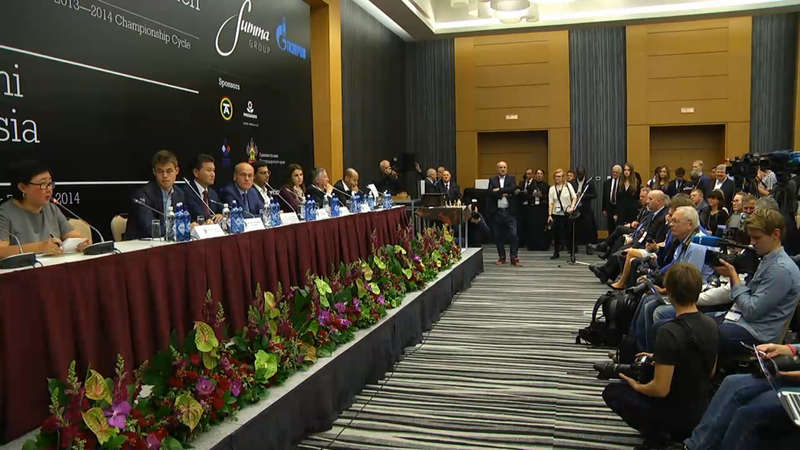 Anand: I’d like to thank everyone who made this event happen here in Sochi. I’ve enjoyed the week here and I’m looking forward to the match starting. Peter Svidler and Sopiko Guramishvili, both elite level chess players, will be the English voices of the 2014 World Chess Championship match. Peter Svidler and Sopiko Guramishvili are going to be the lead hosts at the upcoming match in Sochi. A number of special guests will also join the studio conversation. One of them will be Vladimir Kramnik, the undisputed World Chess Champion from 2006 to 2007. Also, there will be Russian language commentary provided by Sergei Shipov, Ilya Smirin and Alexandra Kosteniuk. The Tashir Group of Companies and the Russian Chess Federation are the organisers of the International TASHIR Chess Tournament in memory of Tigran Petrosian, which is to take place between November 3 and 11 at Novotel Moscow City. The tournament is held in memory of the 9th World Chess Champion, who would have celebrated his 85 birthday this year. Tigran Petrosian (born June 17, 1929, Tbilisi - died August 13, 1984) played for the Soviet Union and is the 9th World Chess Champion from 1963 until 1969. Petrosian is an international chess master (1952), honoured master of sports of the USSR (1960), the four-time champion of the USSR (1959, 1961, 1969, 1975), the three-time champion of Moscow. Doctor of Philosophy, chess theorist and journalist, editor of the Chess Moscow monthly magazine (1963-1966), founder and chief editor of the “64” monthly magazine (1968-1977), the nine-time winner of the World Chess Olympics as a member of Team USSR. Nicknamed Iron Tigran for his unsurpassed skills in defence. The second stage of the Grand Prix series 2014-2015 is held in Tashkent (Uzbekistan) from the 20th October until 2nd of November. The winner is Dmitry Andreikin with 7/11 points.